This is not an asteroid crater. This is not an asteroid crater. Or so says a new study looking at the moon's largest dark spot Oceanus Procellarum (a.k.a Ocean of Storms). 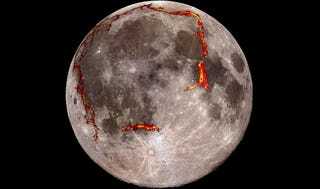 But the newly proposed origin is equally cool: A stretching of the lunar crust, driven by a process that researchers compare to plate tectonics here on Earth.